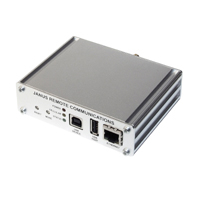 The Janus 400AP is a powerful, Single Board Computer with Cellular Technology housed in an aluminum enclosure. Available in 2G, 3G, and 4G LTE cellular versions, as well as WLAN variations, the 400AP products are ideal for use in all wireless applications that require advanced processing and robust connectivity. External connectors allow the customer to choose the precise antenna for their application needs. Dimensions: 3.15" x 4.27" x 1.18"